Sculpted solid brass in "smoke" acid patinated finish, machined and mechanically fastened. handstitched goatskin parchment shade, with hand-dyed braided cotton cord. All material finishes are living finishes: they will change and patina for the better with time and use. Goatskin parchment is an excellent diffuser of light and is naturally figured and textured, similar to the surface of the moon. Individually hand assembled and stamped with a unique serial number. Slight variations in color, size and shape are to be expected. Recommended bulb "G16 5W LED 2700k" included. Maximum 40 watt bulb. 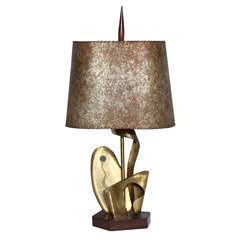 Overall size 14” height, shade 8"H x 8"W x 5"D. "Smoke" acid patinated brass components can be rebrightened over time by buffing with a soft dry cloth. Never clean lamp with any liquid products or detergents. Provided wired as per North American standards. UL certification available upon request. Please confirm brass finish when placing order; price shown for Smoke Acid patinated brass. 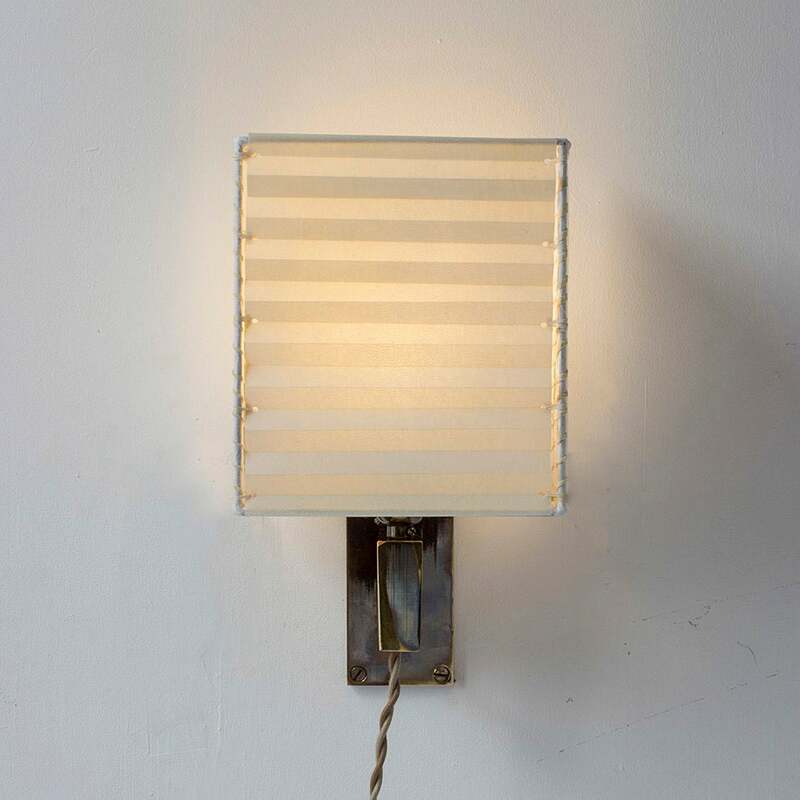 I am a designer and maker working from an industrial studio in Greenpoint, Brooklyn. After spending a lot of time in museums thinking about the progression of the things we make, I came to the idea that instead of aiming for a factory-made appearance, I could leave my hand visible in every object I produce. I use materials and techniques that promote subtle variances, such as hand-dying leather, or acid rubbed patina solutions on polished metal. For my "Series" collections, I establish a set of rules, such as a group of materials or techniques, culminating in one first prototype. Those rules are then applied to a family of objects, each expressing that form with varying sizes or functions, often responding to customers' requests and ideas. My ambition is to create new Series indefinitely. Each piece I make is individually hand assembled and stamped with a trademark and unique manufacturing number. Pair of Mid-Century Modern faux lacquered goat asking table lamps. Nice square rounded edges pedestal shape base. 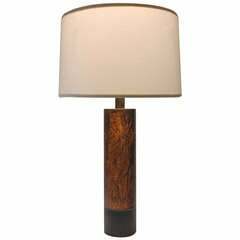 Very elegant table lamp by Aldo Tura Milano from 1960, In brown goatskin and brass. 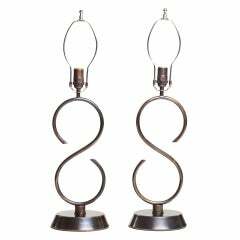 Pair of patinated brass mirror image S sculpture lamps, circa 1970s. 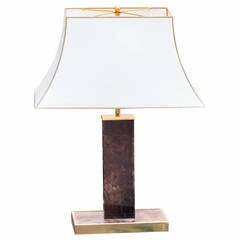 A 1960s Brutalist patinated brass table lamp. New sockets and rewired shade not included.